Democrats won control of the House of Representatives in November in part by promising to work across the aisle and get things done. Now the newly elected freshmen must decide how they will use their newfound power in the face of the longest partial government shutdown in U.S. history. The sharply partisan battle of President Trump's demand for a border wall with Mexico started before the new Democrats even took office and has dominated their first days in Congress. As the stalemate drags on, they are forced to decide whether they will stand with House Speaker Nancy Pelosi, D-Calif., or that now is the time to cut deals with Republicans. For many freshmen, starting their service amid the shutdown has been a sharp reminder of the limitations of the power that comes with elected office. Like a lot of these new lawmakers, Rep. Elissa Slotkin, D-Mich., ran on a promise to overcome rancor and get Washington working. The shutdown is not making that easy. "A lot of us are very much can-do people, we're very concrete people, we're very practical people," Slotkin said. "All I want to do is solve it." The first weeks of any Congress are supposed to be about basic housekeeping. The party in power passes bills to set its agenda, fill its committees and have meetings to organize. Democrats are still doing most of those things while also trying to figure out how to do the even more basic task of funding the government. So far, the freshmen are sticking together by focusing on Pelosi's demand that Trump agree to reopen the government before starting any real negotiations on the wall or border security. That request allows Democrats to remain unified by focusing on the broad goal without ever having to face very real policy differences they have over border security. Moderate members from areas once held by Republicans, like Max Rose in New York, don't support the same policies as the outspoken progressives who were just elected in solidly blue districts. Rose says the unity over the first step — opening the government — is simple. "That shouldn't be news," Rose said. "I just want to see people get paid." Rose was one of several freshmen who were part of a bipartisan delegation that went to the White House this week to meet with the president about the shutdown. Even there, they didn't get into the weeds. They just asked to reopen government so the negotiations can move forward. Minnesota Democratic Rep. Dean Phillips was a part of that group. Like Rose and Slotkin, he flipped a GOP-held district in November on the pitch that he would work across the aisle. Phillips remains in Pelosi's camp on strategy. "It is a unifying perspective," Phillips said. "The fact is we have our border security officers and TSA agents and air traffic controllers, the people who are charged with protecting us aren't getting paid right now." But many are confronting the pressure to fulfill their campaign promises immediately. Their first weekend home as members of Congress was the exact same weekend that federal workers started missing paychecks. Rep. Debbie Mucarsel-Powell, D-Fla., said she is well aware that this group of freshmen wields power, but they still need to figure out how to use it. "Don't doubt for a second that we don't understand that we have a lot of leverage," Mucarsel-Powell said. "We need to make this government work for all of us." It usually takes months, if not years, for the shrewdest of politicians to develop relationships and learn the tactics necessary to really exert influence on Capitol Hill. Freshmen start at the bottom of a 435-person food chain with 435 different priorities. "We have a system of governance that is designed to make change hard and progress difficult," Phillips said. "It works darn well." Several members said the shutdown has had the surprising side effect of forcing them to grow close as a group faster than they expected. The freshmen have their own strategy sessions and they are already taking advantage of being political celebrities who attract lots of media attention. 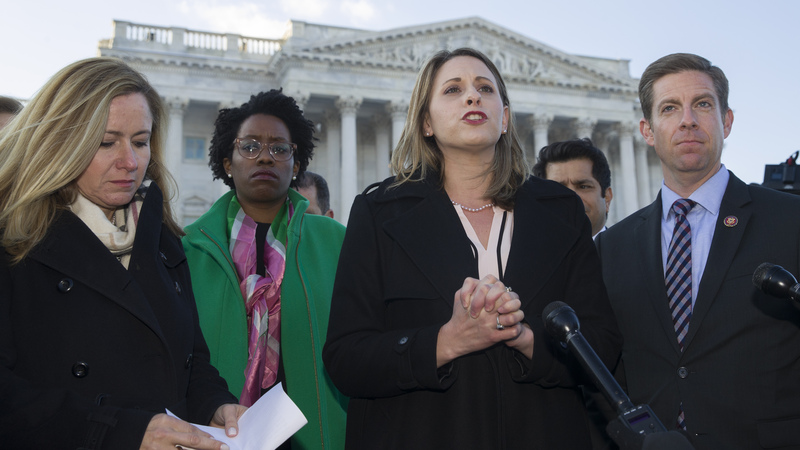 That much was on display when a group led in part by California Democratic Rep. Katie Hill called its own press conference to march to the Senate to demand a meeting with Majority Leader Mitch McConnell. "We're ready to negotiate. We're ready to make a deal," Hill said. "But we have to get people paid." McConnell wasn't there. And he wasn't around a day later when the group returned to deliver a letter demanding that the Senate vote on several spending bills that have already passed the House. The spectacle got a lot of attention, but it didn't move the negotiations forward. Hill, one of the co-chairs of the freshman class, said the representatives have remained unified behind Pelosi so far because her demand has been consistent that she will negotiate on the details once the government is reopened. "We are very much aligned with the strategy of we have to hold strong," Hill said. Navigating bigger policy splits will come later.